For a dessert that’s only two ingredients, I sure had a hard time naming this one. 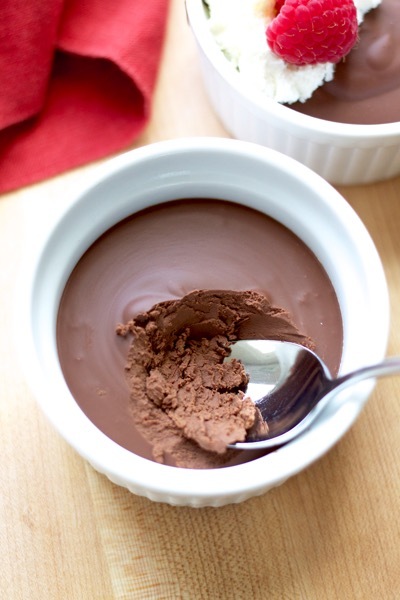 An intensely chocolatey concoction of coconut milk + deep dark chocolate, chocolate mousse truffle cups are mousse-ish, but not fluffy, and truffle-like, but you can eat it with a spoon. 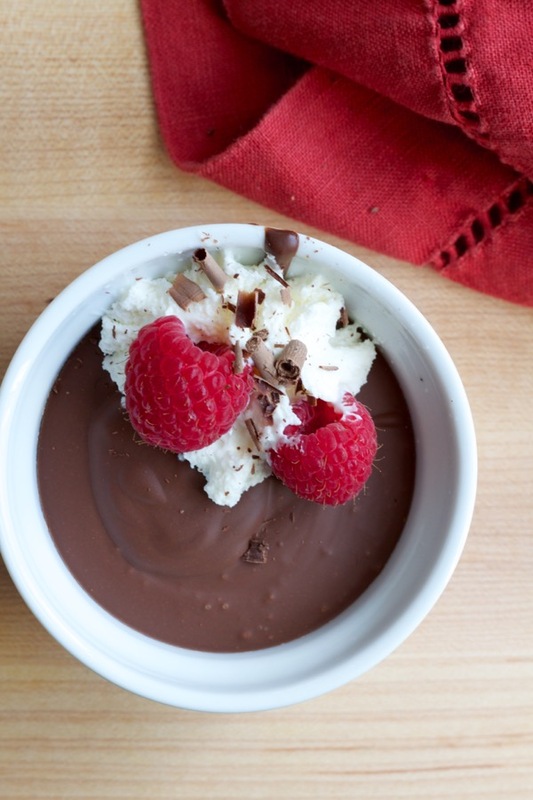 I don’t really care what you call it, but if you need a quick, easy, make-ahead dessert for Valentine’s Day (or any day) – this is it! 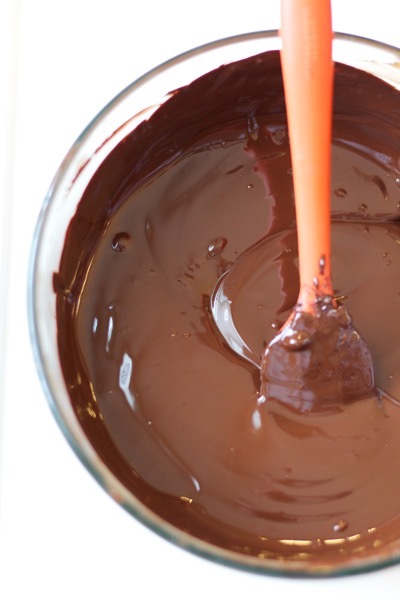 It takes less than 10 minutes to chop up some dark chocolate (or you can use chocolate chips! ), melt it in the microwave, and blend it up with a can of coconut milk. If you can find a dairy-free chocolate bar, this is a vegan treat! (Is anyone else mourning the fact that Costco doesn’t seem to be selling their enormous bag of Kirkland brand chocolate chips? They were dairy-free and less sweet than other brands. I miss them!) Then pour that luscious, dreamy mixture into individual serving dishes and let it chill for an hour or so. I was trying to be cute for pictures, so I added a squirt of whipped cream, a couple of berries, and some chocolate shavings…but I normally serve these babies straight outta the fridge without any adornment. Honestly, the texture is so thick and dense that fluffy whipped cream doesn’t…quite…go? Which pains me to say since I’m an unabashed whipped cream over-user. But I’m in it for the chocolate with these, man. Since the mixture has such a high proportion of chocolate to coconut milk, the chilled chocolate mousse truffle cups are pretty firm. If you have the time (read: patience) to let these sit out for about 30 minutes before you serve them, the chocolate is a little more spoonable. Either way, it’s a dessert that you can linger over and savor. If you’re one of those people who takes two bites of something intensely chocolate and says, “Oh, this is so rich, I can’t eat another bite” – this may not be the dessert for you. But if you’re like me and you could happily finish that person’s serving, you are going to love this. Melt the chopped chocolate or chips in the microwave at 50% power, stirring at 1-minute intervals until it’s mostly melted, then switch to 30-second intervals. Add the coconut milk and melted chocolate to a blender and blend for about 30 seconds, scraping down the sides partway through if needed. 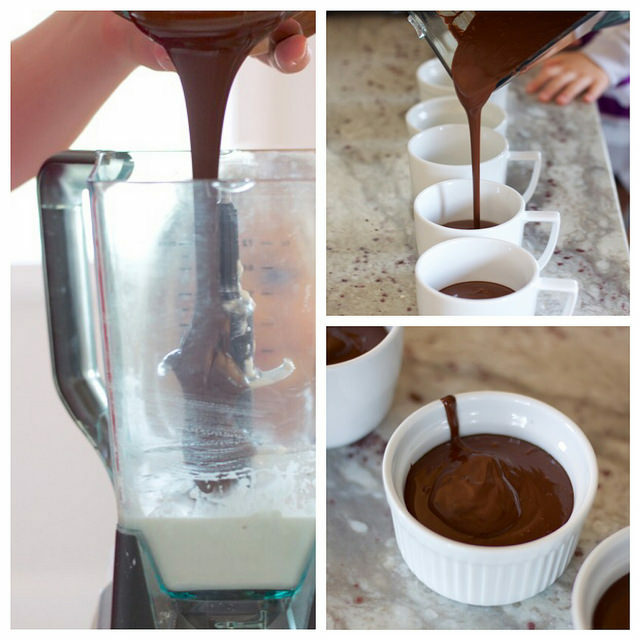 Pour the mixture into small bowls or cups and refrigerate, covered, for at least an hour. When fully chilled, the truffle cups will be very firm, so you may want to take them out of the fridge about 30 minutes before serving to make them more spoonable. Serve with whipped cream and berries as a garnish, if desired! Since the chocolate is so rich, a small serving works! I usually divide it into 6 dishes, but I think you could get away with 8. This recipe is from Cooking With Trader Joe’s – I think it used to be a blog, but this is all I could find to link to! I love the eager little fingers in the background of the pouring pic. An hour is a very long time to wait for those babies! And actually, you prolly made her wait till after dinner. It’s tough to be a kid. I want to sit beside the “oh, this is too rich for me!” people, please. I will shamelessly finish their servings after my own. Baker brand makes a bar that does not have milk in it! These look great!